How do you watch Game of Thrones? Earlier this season, TorrentFreak, a piracy-monitoring website, announced that HBO’s most watched show Game of Thrones had finally passed former HBO heavyweight The Sopranos as the most downloaded show, and even became HBO’s most watched show of all time. Game of Thrones apparently was out for more blood; with roughly 1.5 million downloads only hours after the finale debut, the season 4 finale became the most downloaded episode of a television show of all time. It’s expected to exceed 7.5 million downloads in the coming days, TorrentFreak estimates. So how do you watch Game of Thones? Share your answers with us! 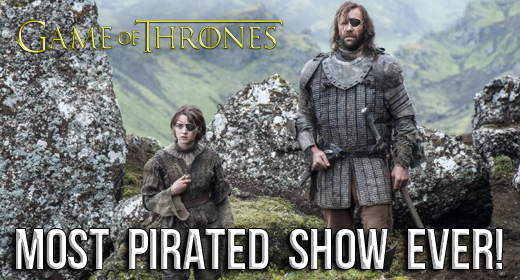 Don’t miss Episode 117 that debuts tomorrow, where we talk all about the Season 4 finale! Leila McGuire liked this on Facebook. Mary Meghan Mabus liked this on Facebook.